A simple hearty soup, that is filling and full of savory and earthy flavors. It’s a perfect meal to serve on a cold day because it can be made in a little more than 30 minutes and will warm you from inside out. Chicken, Mushroom and wild rice are combined in this rich soup to give a perfect savor. To clean the mushrooms, rinse quickly or clean with a damp cloth or paper towel. Do not immerse the mushrooms in water, with plenty of water it will cause the mushrooms to become soft. If you do not use mushrooms immediately, store a single layer in a brown paper bag. For more taste, top the soup with garlic croutons. Serve the soup with salad and bread, for a complete and balanced meal. To freeze the contents in a freezer bag, then put the bag in a square container, once frozen remove the bag. The new shape will save space in the freezer and will stack neatly. The freezer bag also helps you avoid a messy kitchen, just drop the bag into a pot of boiling water to warm up. The soup will keep for a month in the freezer. Clean the mushrooms by wiping with a wet cloth or paper towel. Slice and set aside. Slice the celery, chop the onion and shred the carrots. Melt the butter in a heavy bottom pan, like a dutch oven. Add the celery, onions and carrots and saute for a few minutes. Add the chicken broth, the rice and the rice seasoning that came in the Rice A Roni packages. Turn up the heat and boil for 15 minutes, or until the rice and vegetables are tender. Reduce the heat, add the chicken and the mushrooms and simmer for 10 minutes. Remove from heat, let sit for 5 minutes before serving. Can you cook wild rice in soup? 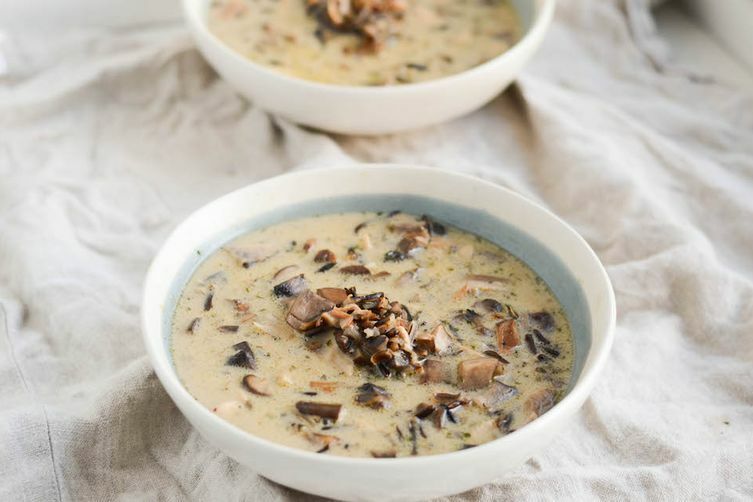 How do you make creamy wild rice soup? What is the best rice for chicken soup? What spices go in chicken wild rice soup? What's in wild rice soup?